We are proud to have been associated with Ercol for many years as a preferred service for restoration and conservation projects. Below is an article from Austin Friar, the newsletter of the Furniture Maker’s Company. Here the magazine reports on our involvement in restoring the Ercol furniture of the Sir Ralph Perring Centre. If you wish to see the original article it is available here. This article has been reproduced with the permission of The Furniture Makers’ Company. In the early 1960s, Sir Ralph Perring had recently become Lord Mayor of London and was involved in the early development of the Barbican area of the City of London, which includes the Golden Lane Estate. 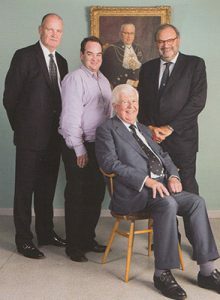 He was instrumental in establishing a community centre, known as the Ralph Perring Centre, within the Estate, to enable residents to meet and interact. Golden Lane is very much the sister complex to the Barbican, with a shared history and similar architectural approach. Pre-dating the construction of the Barbican by 10-20 years, this 1950s housing estate was architects Chamberlin, Powell and Bon’s initial project to renew this area of the City which had been almost obliterated by the Blitz during World War II. 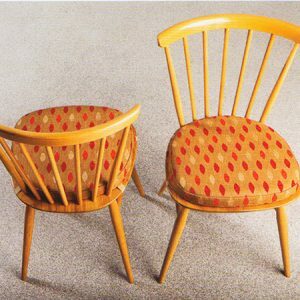 At the time Sir Ralph was great friends with Lucian Ercolani, founder of Ercol Furniture, and when talking to him one day about the formation of the Centre, Lucian offered to provide tables and chairs from Ercol’s Windsor Collection as a gift. Today, 50 years later, the Sir Ralph Perring Centre is alive and well, fulfilling the same purpose of providing a warm, clean and flexible meeting space for all manner of groups and activities for residents on the Estate. However earlier this year, after so many years of constant use, the furniture had reached the stage where it needed attention. While it could so easily have all been replaced with new pieces, in truth the furniture was still robust, the wood still beautiful and the mid-century design still highly relevant. Restoration expert Ludovic Potts, who has worked with Ercol for many years as well as on many major conservation and restoration projects, took on the task, part funded by Sir John and part from his own company. “The project involved removal of all the original finish down to the bare frame, full structural repairs throughout, and applying splices using reclaimed matching timber (beech wood and elm) to retain all the original chairs and tables. The end result is stunning – original English elm, now gone forever from our woodlands, restored to its full glory across a range of chairs and tables. The lucky residents of Golden Lane Estate now have a gleaming set of Ercol furniture for many events and activities to come. You can’t ask for better value than that!